The refrigerator, today, has become one of the basic necessities of life. It helps in the storage of a variety of food items while at the same time retaining their freshness. Capacity: The required capacity of a refrigerator depends on the size of the family it will cater to. In general a household of 2 people would require a 100 to 200 litre refrigerator while a family of 4 would require one of 290 to 320 litre capacity. Size: Even before thinking of looking for a good refrigerator to buy, it is important to chalk out the space required to keep. Once that is finalised and the size of the space duly noted, should the refrigerator size be determined in accordance to it. Shelves: Tempered glass shelves are hardy and quite popular. Chillers: These quick freeze compartments prove to be excellent additions when ice is required frequently and within a short time. Separators: These help to segregate the various items like vegetables and fruits etc. in the vegetable tray provided. Deodorizers: They help to keep the food odour free for longer durations thereby increasing their freshness. Noise levels: Humming noises made by the refrigerator should be barely audible so as to cause no disturbance. Child Lock: This feature becomes a must when there are children present at home to prevent them from opening the refrigerator without supervision. Moisture control: This helps to keep stored raw materials fresh for a longer duration. It is hassle-free and non-messy. Door type: This is a feature which has a lot to do with the buyers liking and the budget set. Generally double doors are preferred since they separate the freezer from the rest of the refrigerator. 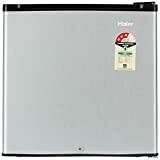 Ratings: The star ratings indicate the energy efficiency of the refrigerator with a star rating of 1 consuming the most energy and 5 consuming the least. Needless to say a refrigerator with a higher star rating will always cost more. There are a number of well- known companies currently making and marketing refrigerators in India. The latest technology of refrigerators includes the ones which come with an in-built inverter. These inverter compressors are extremely energy efficient and go a long way in reducing the utility bills of a household. The choice of refrigerator should be carefully made since it is an investment of a lifetime for most households in India.